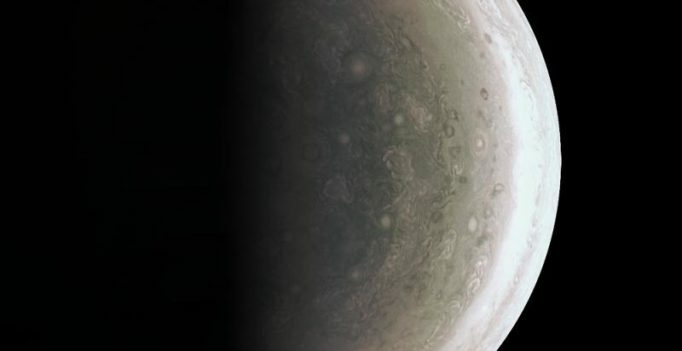 A NASA spacecraft has sent back the best views of Jupiter yet, revealing turbulent storms in the north pole. NASA on September 2 released a batch of close-up pictures taken by the Juno spacecraft last week when it flew within 2,500 miles of Jupiter’s cloud tops. It was the first of three dozen planned close passes during the 20-month mission. The mission’s chief scientist, Scott Bolton, says the north pole is stormy and appears bluer than the rest of the planet. Jupiter, the largest planet in the solar system, is a gas giant shrouded in colourful stripes and swirls. Juno entered orbit around Jupiter in July after a five-year journey to map the planet’s poles, atmosphere and interior. It’ll fly closer to Jupiter than any other spacecraft.